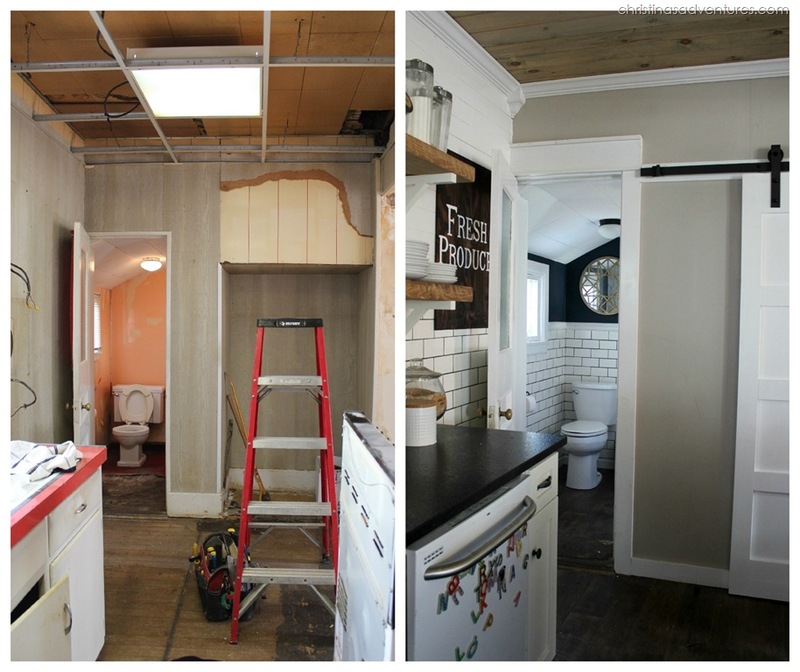 Incredible small bathroom makeover – you have to see all of the details of this fixer upper to truly appreciate just how far it’s come. 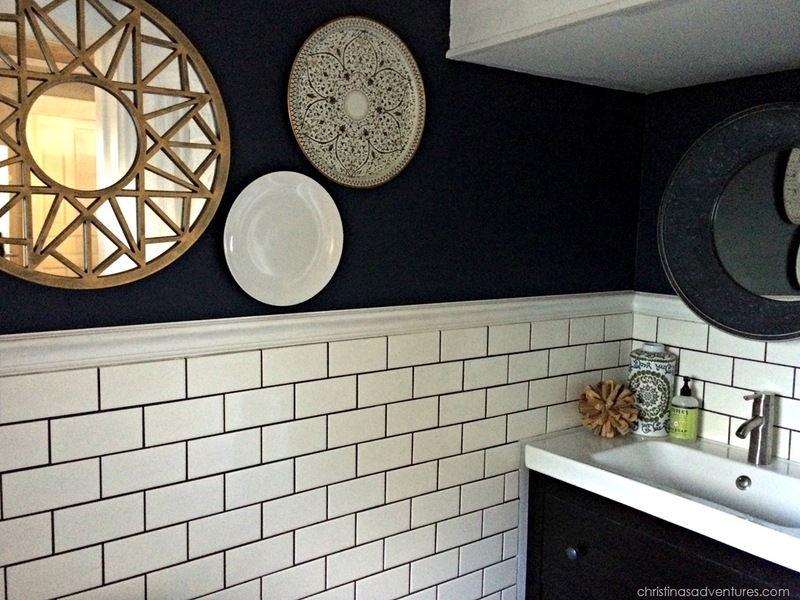 Navy walls, white subway tile, and much more! This post also contains some affiliate links. Full disclosure here. This bathroom. Woah. Let me tell you – it’s come a LONG way. Let’s start from the beginning. 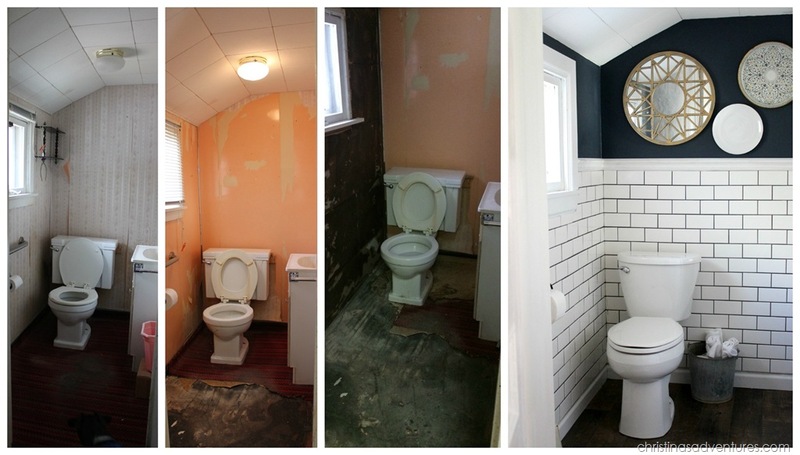 When we bought our 1902 Victorian, it had a very small and very ugly second bathroom. When I say very small, I mean VERY small. You could sit on the toilet and wash your hands in the sink at the same time. It had some nasty carpeting on the floor and peeling wallpaper. When we removed the wallpaper, we found something even worse: salmon pink laminate walls. Seriously GROSS. I posted lots of these lovely pictures on my Instagram – follow along with all of the remodeling progress by looking through #FixingUp1902! We weren’t planning on actually attacking this bathroom. It was small, but it was functional, and we were just going to cosmetically change it and then attack it in a few years. UNTIL a pipe froze in the middle of the winter. Apparently, there was no heat going to the bathroom. It was a poor construction job that was added on decades after the house was built, and when we went to explore the frozen pipe (that ended up becoming a burst pipe), we saw just how bad the supports were under the bathroom. You probably could have kicked a hole through the rotting floor! 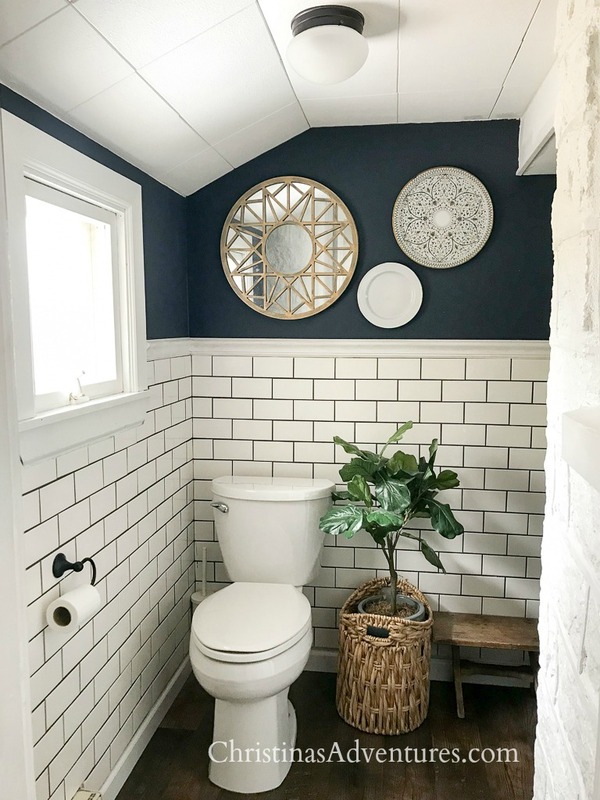 It was time to gut the bathroom, and we had no choice – it was time to start our small bathroom makeover! While we were gutting it, we made the decision to add on a few extra feet for our sink area. Best decision ever! It’s still a tiny bathroom, but this little bit of extra room truly makes it work. We lived with the bathroom having just bare drywall on the walls (we used the same flooring as we did in our kitchen remodel, so that was done already) for the past 6 months. 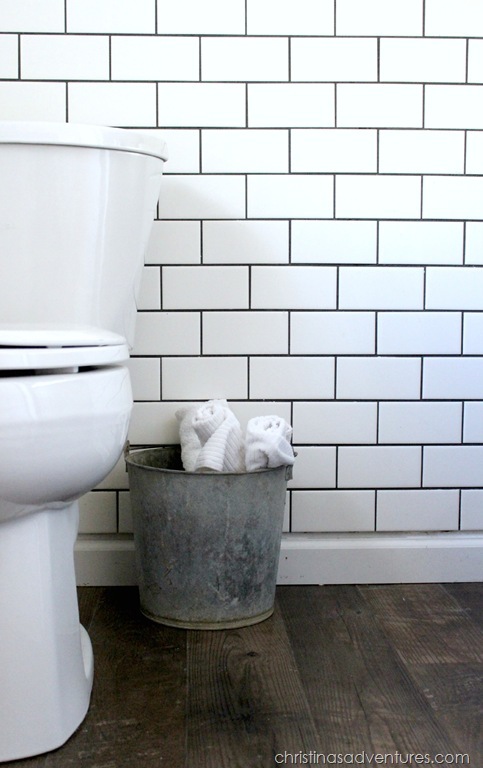 I have a thing for classic white subway tile. I kind of LOVE it. It gives this bathroom such a clean look, and I love how timeless it is! My husband & I did the tiling/grouting ourselves, and were remarking on how it was pretty different than the last time we tiled/grouted in our kitchen. When we did our kitchen, I was 9 months pregnant, and now we were quietly doing it at night with our 2 year old and our 5 month old sleeping upstairs. This IKEA vanity is perfect for our small bathroom. It’s got space on the sides of the sink, and the drawers are nice and deep for storage. And the porthole mirror just ties everything together so well! I love the heaviness and weight of it in this space. I had fun going BOLD with our wall color on top. I knew it would be such a small amount of wall space, and I am just in love with this moody color! It’s “Hale Navy” by Benjamin Moore – and you’re going to see it making another appearance in a big way next month! 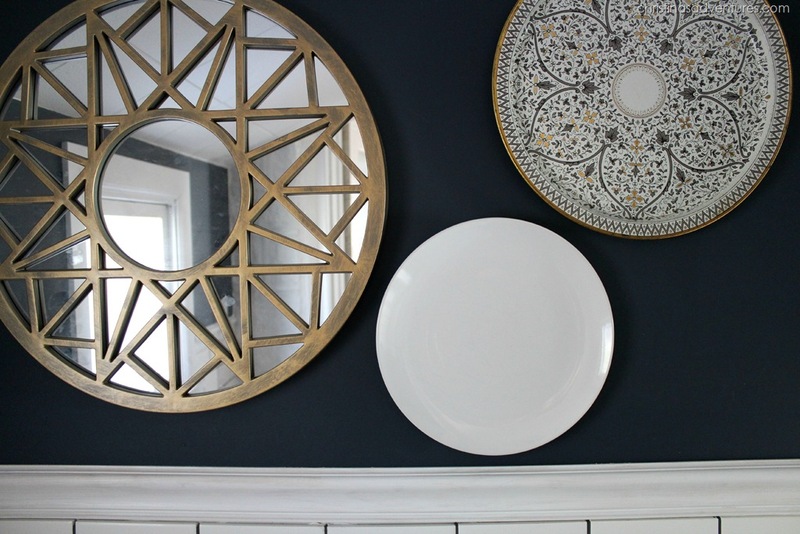 I moved the gold mirror from our kitchen to here – I honestly was never in love with where it was in the kitchen. This gold was made to go with the navy and white! I just can’t get over this transformation. I mean, we’ve lived through the past 10 months, but it really helps to take a step back and realize just how far we’ve come! We finally have a beautiful little bathroom for guests to use when they come over, and I couldn’t be happier with it! I am so thankful to Raymour & Flanigan for providing me with the mirror for our bathroom. As always, all opinions are 100% my own. Oh my, I love this!!! So pretty. Is that wood tile flooring? 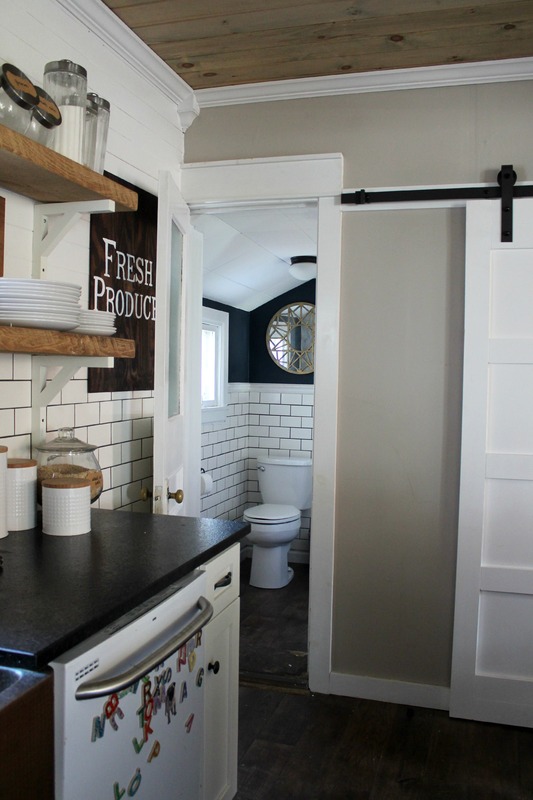 I like the contrast of the rough wood with the subway tile. Thanks so much, Erin! It’s Luxury vinyl tile 🙂 We used it in our last kitchen & loved it so much – we used it in this house too! What’s the color of the floor ? It looks great . Thanks Kristin! Unfortunately, I don’t know the exact color 🙁 I’ve tried to look it up on my receipts and it just says “Adura Dockside” – I don’t remember the shade 🙁 So sorry! It looks so great! 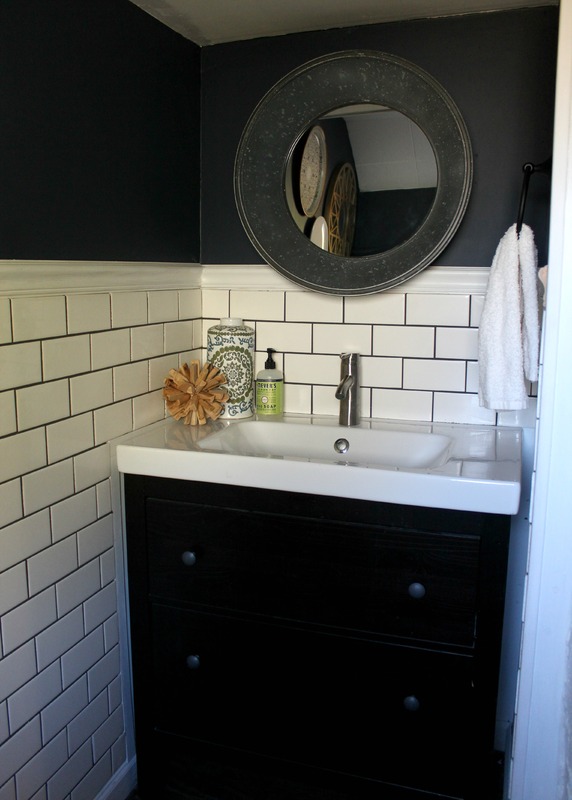 I’m dying to use the Hale Navy somewhere in my house – I’m thinking the inside of the laundry closet or linen closet. 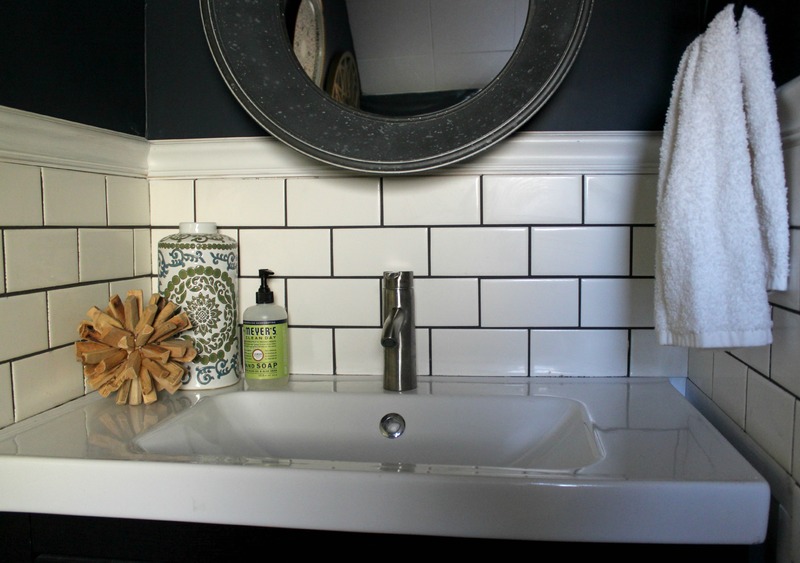 The white tile balances out the dark walls and you did an amazing job using the space! looks great, i love the medallions. enjoy your new space! 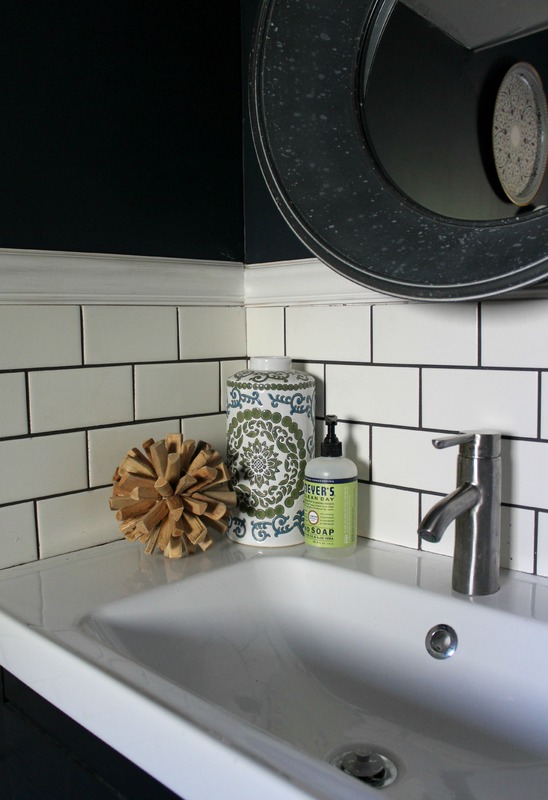 I love the use of dark grout. It takes simple tiles up several degrees. Plus the dark doesn’t show stains like white would. Great job you two! This may be a duplicate post; the first one “disappeared” while I was typing. Love what you have done with your home. Have numerous questions but 1st one, for now, what is your kitchen counter?? I REALLY like the matte BLACK finish. Am on a poor man’s budget but have a small kitchen countertop in my 700 sq.ft. place. This area used to be apartment complex but now called “Condominiums”. Built in 1970 and needs a few updates for my taste. I am a “retired toooo early senior on fixed income but the creative juices constantly flow. You have inspired me! I have been wanting to remodel my bathroom! we have remodeled our living room, kitchen, and master bedroom all in the time span of 2 years! 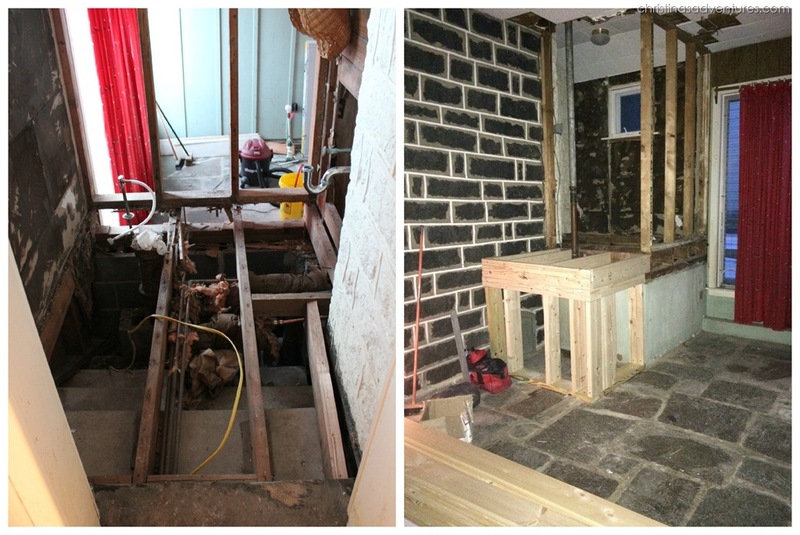 I want to get rid of my shower and a tub but we are not sure there is enough space for a tub! 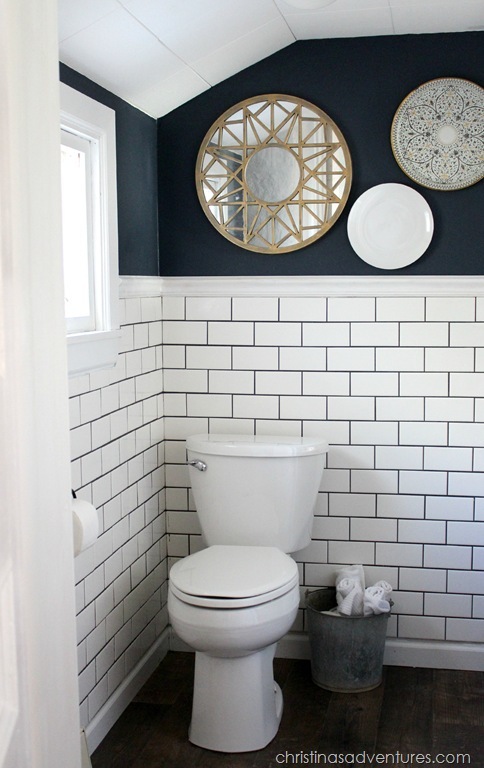 Anyways, I love your dark walls with the white subway tiles! Your remodel projects are on point! I really love the floor! Is it real wood, laminate, or tile? Thanks Katie! 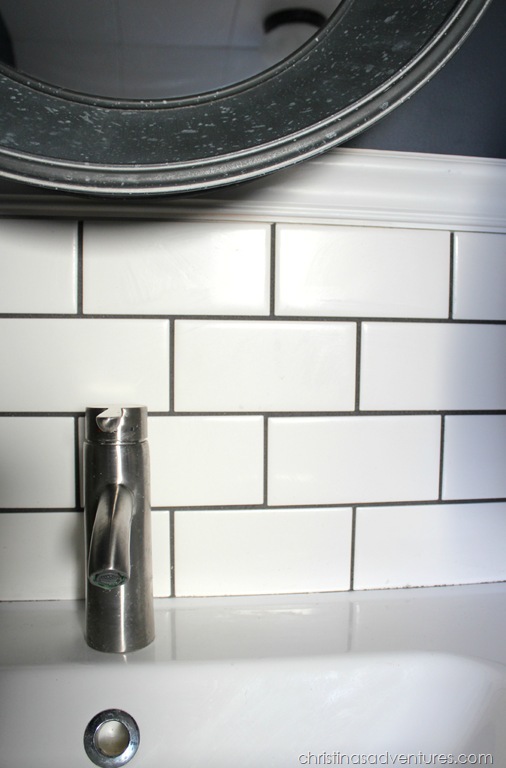 It’s luxury vinyl tile – we installed it in our previous & current kitchen as well. It’s super durable! I can’t believe how much bigger that tiny room now seems. What were the room measurements before and after? Is that just wood trim that you’ve put on top of the tiles?? Seems like a good option as the porcelain versions are expensive!! SO kind of you, thank you Cindy! !